It was February when I bought this on a whim, and it only took a few listens for me to revise my Best of 97 list to include it. 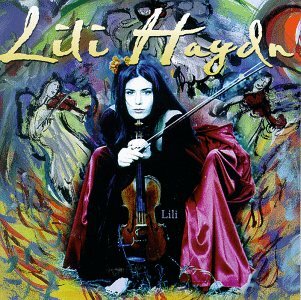 Lili Haydn is a violinist of great talent. She’s apparently been doing the rounds as a session player for years, but this is her first release under her own name, and it’s an amazingly self-assured and unique collection. Stylistically it runs from ethereal vocalizing with quiet accompaniment to thunderous jagged electric riffs, from pretty pseudo-classical instrumentals to Middle Eastern warbling over crashing rock guitars. Through it all, her expressive violin adds an emotional grounding. At various times on the disc I find bits of Kate Bush (a light vocal touch not afraid to growl), Led Zeppelin (the interplay of bass-drums-guitar), Nirvana (the contrast of soft and loud),and even Gentle Giant (some great wah-wah violin). As a further bonus, the lyrics are quite good, covering topics from homeless teens and child abuse to hopeless relationships. The thematic suite consisting of “Baby,” “Mama,” and “Daddy” provides a central core to the album. “Mama” in particular, with its poignant portrait of a woman in an abusive relationship (“Mama, why do we go back for more even when we’re curled up on the floor from blows that we’ve endured?”), provides a kind of catharsis that moves even someone who’s never been near a similar situation.